The adult Dectes stem borer, Dectes texanus texanus (Coleoptera: Cerambycidae), is a long horned beetle approximately 3/8 inch long and gray in color. It has long, slender antennae that can be one and a half times longer than the length of its body (Figure 1). In Kentucky, adults can emerge from June to August. After mating, a female beetle chews a small hole in a leaf petiole or stem and then typically lays a single egg inside. The oviposition period can be up to 45 days. Both adult and larval stages of Dectes are known to feed on soybean, with the larval stage the most damaging. Figure 1. Adult Dectes stem borer is a long horned beetle; its antennae can be 1.5 times longer than the length of its body. (Photo: Nathan Yielding). A Dectes larva takes on the appearance of an accordion (Figure 2a) with deep segments; it is creamy white with an orange-red head. The larva hatches and makes a tunnel in the stem while feeding. Only one stem borer larva is typically found on a single soybean plant due the stem borer’s cannibalistic behavior towards other larvae. Later in the season, the Dectes larva can move to the lower part of the stem and girdle the plant; it can even move near roots (Figures 2b and 2c). The Dectes stem borer overwinters as a larva and pupates by March to April. Dectes stem borers only have one generation per year. Figure 2. (a) Dectes stem borer larva in a green stem, (b) larva in lower portion of plant; and (c) stem girdled by Dectes larva. (Photos: Yaziri Gonzalez (a) and Doug Johnson (b & c), UK). Brenda Kennedy (Plant Disease Diagnostician located at the Plant Disease Diagnostic Laboratory in Princeton) reported the presence of the soybean stem borer or Dectes stem borer on soybean samples from Webster and Henderson counties from August 18 to September 5, 2017. On September 8, during a visit to a commercial soybean farm in McLean County, we found plants with tunnels in their stems caused by the Dectes stem borer. 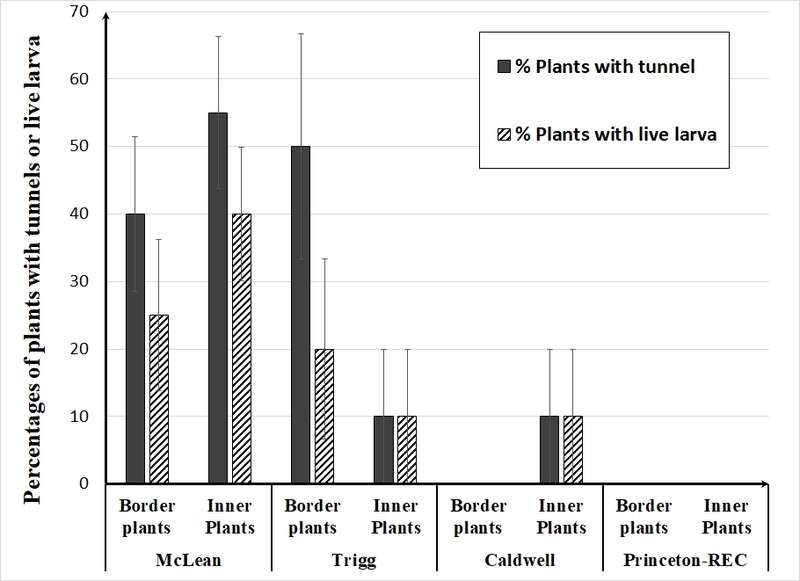 Dectes tunnels were found on 40% of border plants and 55% of inner plants (greater than 250 feet from the field edge). Also, live larvae were found on 25% (border) and 40% (inner) plants (Figure 3). Similarly, Dectes infestations were found on 50% of border plants in a commercial field in Trigg County on September 15. However, in a commercial field in Caldwell County and in an experimental plot in the University of Kentucky’s Research and Education Center at Princeton, 10% and 0% of plants were infested, respectively (Figure 3). Soybean fields with large infestations of Dectes can run into problems during harvest. Larvae overwinter in stems and can girdle and lodge them (Figure 2c). Lodging specially occurs under drought conditions and when soil moisture is lower than 70%. 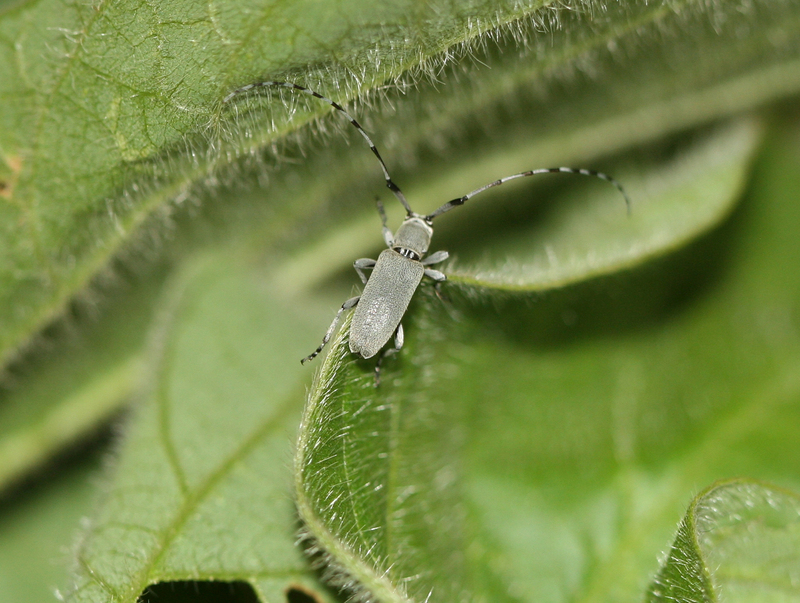 Adult stem borers can be scouted in soybean fields with sweep nets in late June or early July. Signs of larvae infestation can often be mistaken for sudden death syndrome caused by the fungus Fusarium solani. When scouting for larvae, cut open stems and petioles of plants in order to determine if any feeding damage has occurred. With no currently available resistant varieties of soybean or state regulated insecticides, the best method to avoid yield losses is cultural control. Early harvesting of soybean once it has matured is recommended in order to avoid girdling and lodging when fields show a high number of larvae infestation. Fall tillage and crop rotation can also limit the occurrences of Dectes since these beetles are not strong fliers. Management of Dectes weed hosts, such as cocklebur and giant ragweed, in and around soybean fields can also decrease their populations. Insecticide control for larval populations is not recommended as this insect makes tunnels in stems where insecticides cannot penetrate. Control of adults is not recommended because their presence in fields is for a long period and previous studies haven’t show a positive relationship between the control of adult Dectes and infestation of plants.